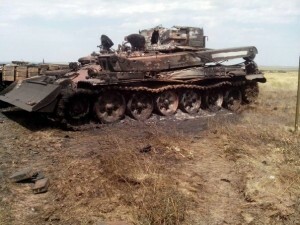 Over the past two weeks (starting with the 1st of July) LPR [Lugansk People’s Republic] militiamen inflicted substantial losses on the enemy, eliminating over 800 men, with 4 militiamen killed. 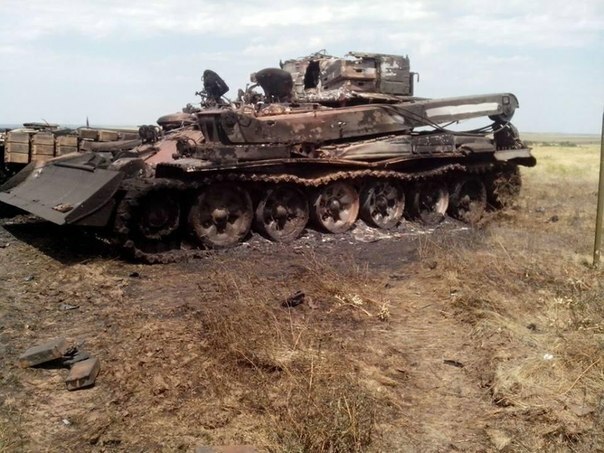 In addition, over 50 armoured vehicles were destroyed (just over the last twenty-four hour period, 3 tanks and 1 APC were destroyed in the area of the Uralo-Kavkaz settlement). Ukrainian army buries its fighters with excavators, right on the hills beyond the Porechye settlement, where they have their deployment camp. Those people who will never see their sons or their husbands come back to them [should know] that their loved ones may be on one of the hills of the Krasnodon region. It is perplexing that the Kiev government is covering this up, as if it will not become known, sooner or later. These numbers were determined by asking various units (artillery, reconnaissance), and only that which they saw with their own eyes was added. With respect to the settlement of Izvarino – what the Ukrainian mass media writes is pure nonsense. After all this time, we have no dead, and only several have been lightly wounded. The city of Krasnodon continues its tradition of being a hero city. I want to say a few words about those Ukrainian soldiers who were allegedly forced to fight, and were told it’s either prison or the army. If you are given a choice between killing your own compatriots and being imprisoned, and you preferred to go and kill your compatriots, then you don’t deserve to be called human. The western regions twice overthrew the government, without consulting us; and so we thought – live however you like, and we will build our life the way we like. And that’s when you came and started killing us. The only chance to keep a unitary state (and even then it’s science fiction), is to: prosecute the Junta, prohibit nationalist organization and to prosecute their leaders, refuse the association with the EU, join the Customs Union, and make Russian the second state language. But I will tell you what’s really going to happen: Novorossiy will free DPR [Donetsk People’s Republic] and LPR and then arm volunteers in Kharkov, Zaporozhia, Odessa, Nikolayev, Dneptropetrovsk, Kherson, and Zakarpattia regions. And then there is no chance that the oligarchs and the nationalists will trial. I think that they understand this and will continue sending ever greater numbers of people to their death, all the while concealing the real statistics of the dead and the wounded. Just now, in the area of Amvrosievka, we paid back Ukies for the shelling of Dmitrievka. A Ukrainian division of “Grad” systems returned back to base camp peart and upbeat (they got the job done! there will be bonuses!). And that’s when they were got their comeuppance, a hundred-fold! Right there and then. With respect to claims that we hide behind the backs of women and children … This a complete falsehood. The positions of the militiamen are will known to Ukrainian intelligence. And the Ukrainian forces have plentiful opportunities specifically to attack the firing positions of the militiamen. As well as to engage with us in direct combat. However, you, the Ukrainian forces, were always pathologically afraid and remain afraid of doing this. And, guided by American advisors, you are using their tactical instructions. Unlike you, however, Americans hit strangers with direct fir, which you are lobbing shells at those whom you call your own, you shell residential districts, children, you fire artillery knowing full well through drones and your reconnaissance that there is no Militia there. Like Nazis, intentionally and calculatingly, you kill children, women, defenceless civilians, and the elderly, most of whom have no relation to the Militia whatsoever and are simple laymen. Those very laymen, the majority of whom do not care where to live – in Ukraine or in Novorossiya. In other words, you kill them because they do not care. You only need those who are like you, who are ready to be slaves to the West. 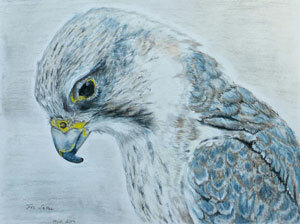 And contrary to all common sense, for some reason you call yourself independent Ukrainians. Regarding belief in God. The Blessed Virgin Mary has two worldly abodes: the Holy Mount Afon and Russia. Through your hatred toward Russia, toward Novorossiya, you demonstrate to the Orthodox faith that you are, in essence, Satanists. While we defend the faith of Christ. We are ontological enemies … We do not betray our guys because they simply are not afraid of you and do not conceal themselves. You understand the reason why. Our fighters are certain of our victory. 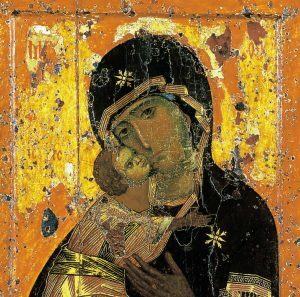 Novorossiya will exist, Glory be to Christ and to the Blessed Virgin Mary. Igor Strelkov: Several civilians died. Not one militiaman was harmed. Altogether, there were either 4 or 5 heavy shells. Looks like the lesson we taught the commanders of Ukie artillery last night fell on deaf ears … I received reports of a shelling. Perhaps an airstrike also took place. That’s why I took Kurginyan’s libel calmly and indifferently. These days, our fighters don’t watch TV, don’t spend their time on the Internet, and have no clue who this Kurginyan is or what he blurted out. And if someone were to tell them, they know anyways that it’s all a lie. Kurginyan’s statement is like a mosquito bite – yes, it’s unpleasant, but you scratch it away and forget about it. Igor Strelkov: They won’t get Galicia, they will get jack-all. Galicia is reserved for “nezalezhnaya” [Note: Ukrainian for independent, here referencing Ukraine]. You don’t really expect us to give Ukies Kiev, the “mother of all Russian cities,” do you? The liberation of Kiev from the occupying gang of pedophiles, cultists and other scum is the one of the foremost tasks of our campaign. At the same time, I do not rule out that the liberation of Kiev will be accomplished through a joint operation of the Novorossiya Militia and the Ukrainian Armed Forces. Once, of course, a few of the most fervent admirers of Ukrainian nationalism among the generals get hung off aspen trees. Igor Strelkov: The more they lie, the faster they will meet their end. And lie they do – they have been lying constantly from the very beginning. What’s more, falsehood lies at the very core of their so-called “revolution” and the ATO. God see it all. Only complete atheists and Satanist scum could hope that such impudent lies will help them win. Metallist is now being ferociously attacked by the 30th – this is the mechanized brigade of the punitive forces that hails from Novograd-Volynsk (Zhitomir region). Our forces stand like a wall and are not giving an inch. 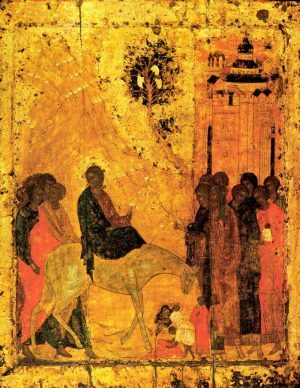 I expect there to be lot of Crosses of St. George. At 02:00 at night, local time, militiamen gave Ukies a fine beating at the Dolzhanskiy border crossing. In addition, Sabovka, Alexandrovka and Roskoshnoye were liberated from the punitive forces. LPR forces are now establishing checkpoints there. A gas depot is burning near Lugansk. 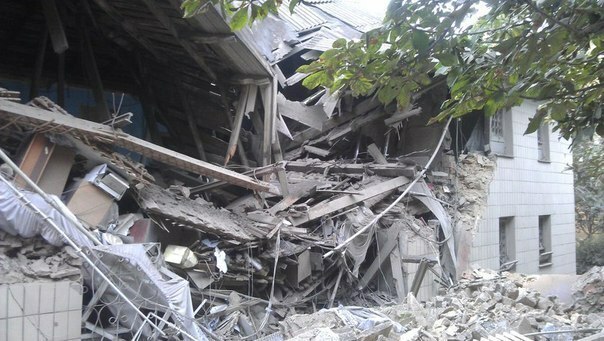 In Lugansk, over the past three days, 17 civilians died and 73 people received shrapnel and gunshot wounds. Militiamen have entrenched themselves in the settlement of Stepanovka, next to the Russian border. This settlement is a new outpost for the Militia and is located three and a half kilometres from the border. The tactic used to defend against artillery strikes, which do not stop day and night, is the same, tried and true and battle-tested – digging trenches. The Ukrainian army is not used to the fact that militiamen here continue engaging in saboteur activity and are ready to fight back in case the Ukrainian forces attempt to break through to the Donetsk-Lugansk highway and take it under their control. And that’s the reason why fortifications have been built here. Among other things, the enemy is utilizing approximately 20 tanks, which are constantly relocated. All the time, columns of the Ukrainian army are fired on by our saboteur-reconnaissance groups. Just yesterday, they destroyed a Ukie supply column. 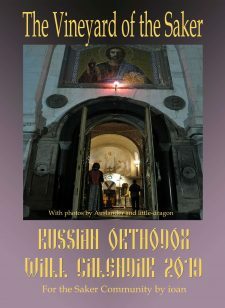 After the attack on Lugansk that occurred yesterday evening, when, as a result of shelling with Grad systems (the Artyomovks district of the city was hit, presumably from the outskirts of Alexandrovka) and airstrikes (the Gayevogo district was bombed) 12 died and 64 people were wounded and received various degrees of mutilations, the rest of the night was relatively calm. According to our operational information, the entire past night units of the LPR army were sweeping the city and squeezing out mobile saboteur groups. Minor skirmishes occurred in the Kamennobrodskiy district. As well, an artillery duel took place in the area of the Metallist settlement. Reports were coming in of mortar shelling of the territories bordering on the railway station; they have yet to be confirmed. Overnight, from approximately 19:00 and until 00:00, the enemy continued intensive shelling of Lisichansk. We have received information from Krasnodon that, pressed by the units of the LPR army and the allied units of DPR, the units of the enemy located there are hastily leaving the previously occupied positions. Lugansk fighters are conducting a sweep of the strategic heights. Igor Strelkov: We are hearing rumours here that today the Militia allegedly left Karlovka and Maryinka (a suburb of Donetsk). They say that I ordered the retreat. First of all, it was not today, it was yesterday. Second of all, it was not Karlovka and Maryinka, but Stepano-Krynka (a settlement to the east of Ilovaisk). Third of all, we did not leave, but took control and are currently reinforcing our positions. Igor Strelkov: And what about flying saucers? Did we shoot those down too? There were no aircraft. And we did not have any tanks either. These are news from a parallel dimension. As for what happened – we shelled their trenches with mortars and artillery. The enemy sustained manpower losses. With respect to yesterday shelling of Dmitrovka with Grad systems: 1 militiaman and 9 civilians died. This is confirmed information. Just now, Ukie air forces bombed Shakhtersk and its surroundings. It has been several days now since Slavyansk was occupied by Ukrainian fascists. They shot the reel for the Ukie patriots and for the Western public in advance, and now reality has come – reality, which was anticipated even during the period of the heroic defence of Slavyansk. We knew then that the city was doomed. Historically, this is not the first situation like that; the same happened following the heroic defence of Odessa, which drew German and Romanian forces onto itself, enabling the preparation for the defence of Sevastopol. So it was before, so it will probably happen again. In Slavyansk right now a humanitarian catastrophe is in full swing. Here and there, there is electricity (at the railway station, at the fish farm, in the Artyom district, and in Golubovka); electricians work privately, restoring the electrical grid where the line is undamaged, but they get no support. The market is partially working, but there are no foodstuffs to trade – only canned goods. Those with private farms are the only ones surviving; it is difficult to imagine what the residents of high-rises are eating. Bread is being delivered from Krasniy Liman; in general, food deliveries are very poor. People hide in their home, afraid, and the occupation authorities do not take an interest in them, except only to identify and arrest the resident of Slavyansk that fought against the Junta. There are problems with the water supply: if you have a well nearby, then you have water, if you don’t – you have none. Last night, Ukrainian fascists conducted an artillery strike with large-calibre MLRS at the underground gas storage facility in Lugansk; it is still burning. 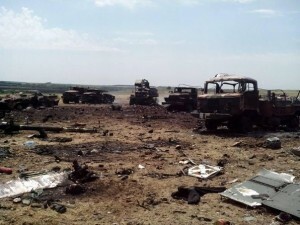 In the area of Amvrosievka, the Militia destroyed a division of MLRS, together with their support transport vehicles and the personnel of the enemy. It was only yesterday that these Junta forces took active part in exterminating the civilian population of Donbass. A new large batch of wounded Nazi bastards arrive in Dnepropetrovsk from the frontlines in Novorossiya; medical services of the city are working in emergency mode. 16:09 (MSK) – A ground attack craft passed over Dzershinsk, heading toward Gorlovka. 16:25 (MSK) – A Ukrainian aircraft just took a turn bombing Saur-Mogila. Are Ukies continuing to claim that they have suspended air force operations? 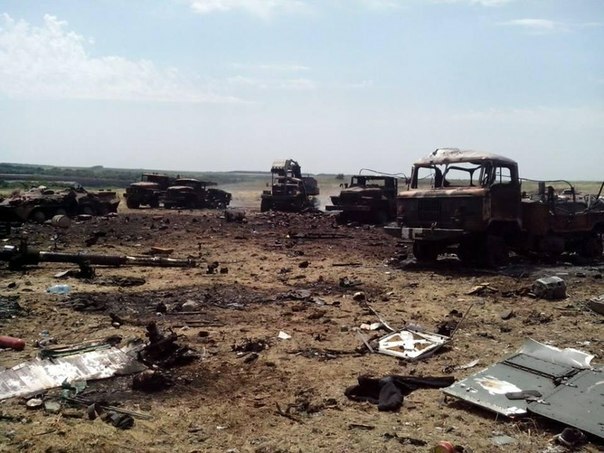 Looks like Ukies are now going to try dealing with Saur-Mogila; artillery is working and there is large number of aircraft – they are bombing Saur-Mogila, and, earlier, they bombed Ilovaisk. Over the past little while, the fighters of our units eliminated: 1 tank, 2 BMP APCs, 3 BTR APCs, 3 mortar units, 1 anti-aircraft system, 2 machine gun units, 6 snipers, and approximately 100 personnel. 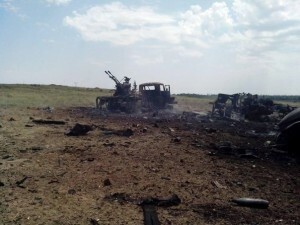 As well in the course of the air assault on Loskutovka, a ground attack craft of the Ukrainian air forces was shot down (the pilot catapulted over the occupied territory, which is where the airplane also fell). Our battalion suffered no personnel losses. And yet, according to Ukie mass media, during the air assault on Loskutovka, they destroyed an entire unit of Chechens from our battalion. As a Commander-in-Chief of the Lugansk People’s Militia, I would like to reassure all the residents of Chechnya, and, in particular, Messr. Kadyrov, that not one of your countrymen died. And could not have died, for the sole reason that there is not one Chechen in the ranks of our Militia. Once again, the Ukrainian command destroyed a figment of their imagination. 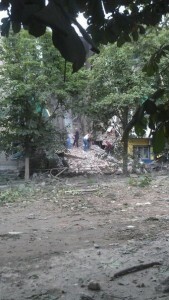 One of the columns of the punitive forces destroyed in the last couple of days. This column was hit with Grad systems by the Militia. Using Grad systems, militiamen opened fire at the deployment positions of the Ukrainian punitive forces in the area of the Yubileyniy settlement and the strategic city of Alexandrovsk. Following the shelling, Alexandrovsk was entered by an assault armoured column of the Militia. Alexandrovsk is now ours and has been swept and purged of the enemy forces. Militiamen are hastily building new checkpoints and fortifications. The army of Novorossiya received of T-80 main battle tanks (breakout tanks), as well as a certain number self-propelled artillery systems 2S1 Gvozdika. Serbs are successfully fighting against the “National Guard” and the punitive forces of Praviy Sector. Serbian fighters have suffered no losses to date. 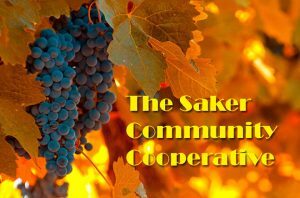 Recently, a new volunteer group from Serbia arrived. The “Yovan Shevich” unit has grown to 35 volunteers. We have been calling it the Slavic Chetnik Unit because, apart from Serbs, the unit also includes volunteers from other Slavic nations. Chetniks coordinate their activities with the command of the army of Novorossiya and are one of the most battleworthy units of the Militia. The Ukrainian Armed Forces are hastily abandoning their previously occupied position near Krasnodon. 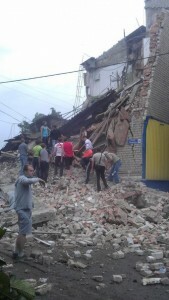 They have also left Aleksandrovka and have begun a withdrawal from the city of Shchastye. Militiamen successfully blew up the communications tower at the Donetsk airport. 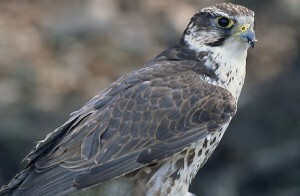 The operation was conducted in the evening of July 15. A group of militiamen entered the territory of the aiport and deployed explosives at the base of the communications toward and in the building containing the control centre of the airport. Militiamen utilized 8 kilograms of plastic explosive. 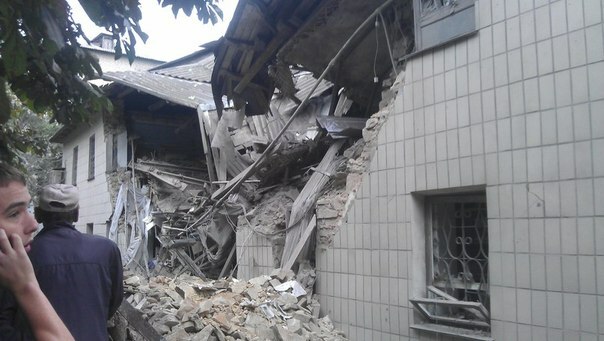 Two explosion, which destroyed the noted constructions, were carried out using trigger unit KPM-1A. Previously, Ukrainian air force used the antennae on the airport communications tower to correct the airdrops of cargo, including ammunition, at the airport. In the Sverdlovsk area, LPR militiamen are shelling punitive forces of the 72nd Brigade using artillery and mortars. In Sverdlovsk itself, militiamen and their armoured vehicles have been deployed. Artillery shelling using Grad systems of the Junta forces’ positions near Saur-Mogila also took place. We are holding strong in Karlovka. We have sufficient armaments and are constantly receiving reinforcements. Fighting against us are Praviy Sector units, Battalions Dnepr and Donbass, as well as the Cascade unit composed of Polish mercenaries. Currently, almost all the civilians have been evacuated, and those that have stayed, 60 in total, remain here because they have nowhere to go and no ability to leave. Yesterday, Junta forces rolled back from Izavarino and Krasnodon (slightly earlier, information was received that the enemy is retreating from Aleksandrovka and Shchastye), having failed in their main task of blockading the former Ukrainian border with the Russian Federation. Having sustained significant losses and experiencing supply problems, on the 15th day of their offensive, Junta forces retreated 30-40 kilometres from Izvarino, south of which lies a kind of a lifeline. As a result, coupled with a growing defeat of the southern grouping of the punitive forces and the Ukrainian army’s failure to relieve the blockade of the Lugansk airport, the LPR Militia has won the strategic defensive operation that lasted over two weeks, while the Junta suffered their heaviest defeat since the beginning of the war. Essentially, the march of the mechanized forces in an attempt to relieve the airport was a gamble intended to reverse the course of the poorly unfolding operation. To resume the offensive, the Junta urgently needs an operational pause because the situation will continue getting worse for the Ukrainian troops. Therefore, it cannot be ruled out that a ceasefire request will be made in the near future, a request which will certainly be refused by the Militia. Enormous columns of retreating Ukie forces are withdrawing across the dam in the area of Kozhevnya (south of Dmitrievka). They are attempting to escape the “cauldron.” There are tanks, SAU-Nonas, refueling trucks, transport columns – all mixed-up. This is bad. But, I hope, not all of them will have the chance to escape. Note: Kozhevnya is a settlement in the Shakhtersk region of DPR, 8 kilometres from the border with Russia. We have received confirmed information. In the cauldron on the southern direction of the front, there are 5 battle units of the Kiev Junta: the 79th separate aero-mobile brigade, territorial Battalion Shakhtersk, the 24th separate aero-mobile brigade, Battalion Azov, as well as the 72nd separate Kiev mechanized guard brigade of the Red Banner. It was the fighter of the latter unit that told Ukrainian Channel 112 about the catastrophe among the Junta forces. Right now, as already reported by Strelkov, almost the entirety of this “cauldron” has picked up and left their positions and has begun chaotically moving, in disordered columns, intending to break out of the encirclement. The Militia now is implementing measures to counteract the enemy’s attempt to breakout from the encirclement. 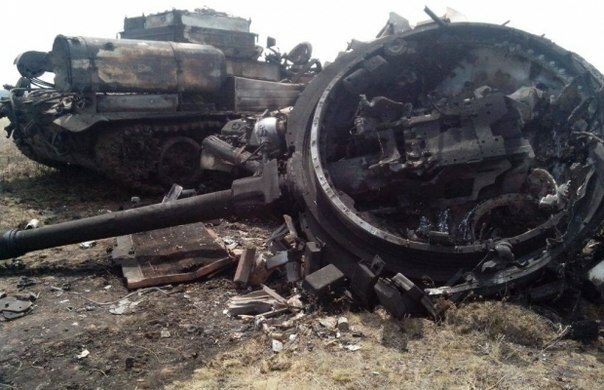 Ukies gained nothing from their assault on Saur-Mogila and lost an aircraft. 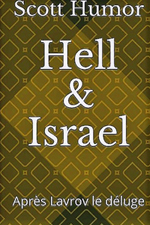 Howitzers of the Militia opened fire at their positions, and an hour later Ukies retreated. In Starobelsk (an LPR regional centre occupied by Ukies) frightened Ukie-warriors attacked OSCE monitors. The latter were forced to flee across the fields in their white Jeeps. This morning, near Amvrosievka, the 3rd Battalion of the 72nd brigade of the occupying troops was shelled with Grad systems, inflicting losses of 4 “200th” [KIA/Killed in Action] and over 10 wounded. Casualties were sustained by the 7th, the 8th and the 9th companies. Today, DPR militiamen blew up the communications tower at the Donetsk airport, using which the Ukrainian air force guided the delivery of cargo, including ammunition, to the airport. 22:56 (MSK) – At the border crossing checkpoint Izvarino (in the Lugansk region), militiamen shelled Ukrainian spetsnaz personnel from Kirovograd. 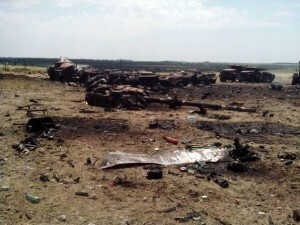 According to a source from the ATO command, the punitive forces lost 8 men and 10 were wounded. 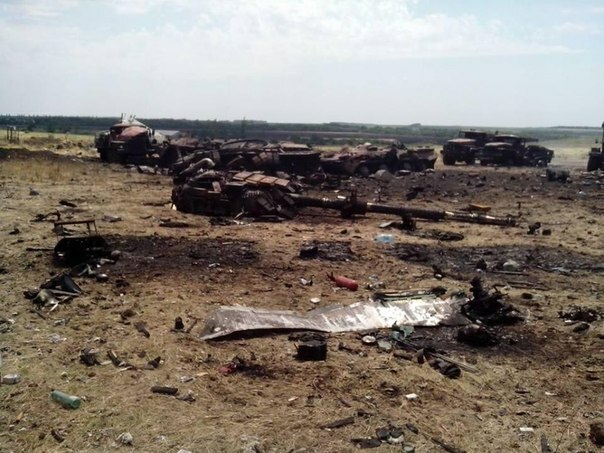 Ukies are also reporting that they ended up encircled near Izvarino, One of their self-propelled artillery systems was hit and only 3 men out of 40 trucks survived. 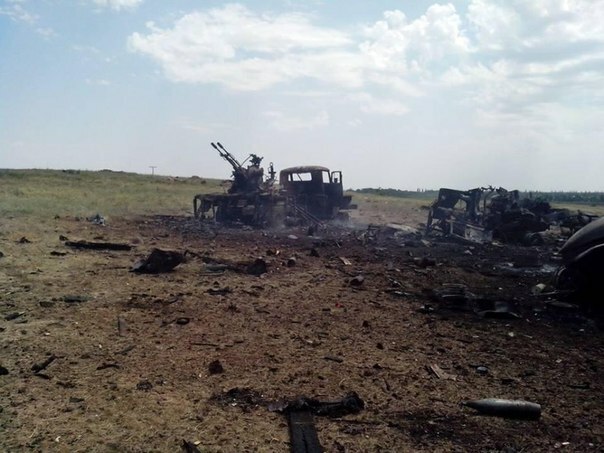 23:07 (MSK) – In the Sverdlovsk area of the Lugansk region, our militiamen shelled the executioners of the 72nd brigade with artillery and mortars. In Sverdlovsk itself, there are lot of militiamen and armoured vehicles. The shelling of the executioners’ positions near Saur-Mogila (DPR) is continuing. Junta Battalions are in a state of panic. 0:24 (MSK) – A bridge was blown up near Gorlovka, on the road toward Ochertino. Active fighting has begun near Amvrosievka – we are squeezing Ukies out of there. Near Krasnodon, we have encircled a unit of the National Guard, the executioners have sustained losses, both killed and wounded. 01:14 (MSK) – An aircraft is flying over Donetsk. Ground attack craft, numbers 1-3, flew over Makeevka, heading toward Kharzisk, and, from there, possibly toward Ilovaisk or Shakhtersk One of the jets flew a circle over Makeevka. Junta has finally lost all initiative across the entire military theatre. The complete routing of the southern cauldron is almost fait accompli. The defeat of the punitive forces near Lugansk is obvious to everyone. Accordingly, in the nearest days we can expect a sweep of the southern border and attempts to complete the sweep of the Lugansk and the Donetsk airports. After all the trophies are put to use [by the Militia], the forces of the Militia and the punitive army will, at the very least, become equal (over the last two days, our heavy armour forces have been “replenished” to the tune of dozens of units), which will enable us to commence wide scale offensive operations. Over the last several days we have been receiving information that the Junta forces are hurriedly reinforcing checkpoints in the Zaporozhia (in Berdyansk, Ukies are creating fortifications by digging in armoured vehicles) and in the Kharkov regions. Probably for a good reason. The march of the enemy is being accompanied. Not all of them will reach their coveted base near Amvrosievka. Not that it is any better around the base itself, anymore. A lot of explositions. Hopefully they can prevent the majority of the Ukies from escaping the Southern Cauldron. 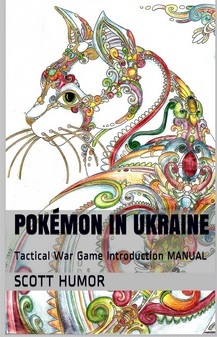 Although not comprehensive, given target audience this may help to contextualise events in “Ukraine”. Thank you so much for all your invaluable work! This post is just incredible, and not just because there’s so much good news in it but because so much is conveyed that’s easier this time, for me anyhow, to get a clearer picture of exactly what’s going on. 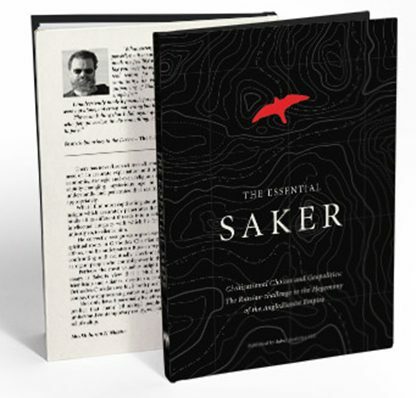 Saker, I am listening to lectures about the early Christian Church. I believe this is relevant from numerous points of view, not least of which is what increasingly appears to me to be Putin’s strong religious beliefs. One could easily explain much of his behavior in religious terms. Do you consider yourself to be in the Apostolic tradition? I cannot imagine that you don’t, but I am not expert. I am the person who earlier asked the question about martyrdom. There are many martyrs now in this conflict, teenage Ukrainian draftees, civilians, militiamen. You said you would post on martyrdom. I would love to read your posting on that. This is a very informative post. I agree with the above statement — the pressure is on the military to determine which way the wind is blowing and take action to remove the criminal Junta in Kiev if they wish to in any way ‘save’ Ukraine as an entity. A night of ‘long knives’ coming up in the not too distant future I suspect if this routing continues. Got the cameras ready for the Huey ‘Saigon’ escape? Thanks for translating all these. The forseen operation is unfolding much quicker than I imagined. Ukrainian media is reporting the seizure of the Lisichansk Oil Refinery by NAF forces under Alexei Mozgovoi. This refinery represents around 40% of total Ukrainian refining capacity. As reported by Еспресо.TV in the Lugansk Central Directorate of police, the plant and kidnapped oil products and cars ” UAZ ” g/n CENTURIES 2064 SA, avtora-ZIL g/n AO 4780 CENTURIES, “GAZ-66” y / n EN 8864 CENTURIES, tractor K-700 g/n 8664. According to local residents, yesterday instead of the usual protection of the plant were put up armed with guns people. Around the plant separatists digging trenches and building fastening areas, writes “the Informant”. Were noticed several fuel trucks that were headed not by a usual route and in the direction of open space and Severodonetsk. “Maybe the fuel is the last thing that remained was taken away!”- commented eyewitnesses. Recall that the area of the city of Lisichansk controls group-Alexey Brain. Behold, being an atheist is not the same as being a Satanist. But an excellent briefing. Thanks.